Also, what about giving your child or children a most memorable birthday party at Snozone? With a skiing or sledging party. Easter Special Offer – Hurry Before it Sells out!!! Great fun for everyone sliding down our real snow slopes on our fantastic aero-dynamic sledges. Please note children under the age of 12 years must be accompanied on the slopes by a paying adult. Gloves or mittens must be worn – we have these available to purchase if you don’t own any. We also recommend you wear snow boots or wellies and warm socks otherwise you may find yourself with wet, cold feet! 30 minute sessions on Wednesday and Friday mornings at 10.30am in Milton Keynes. On Wednesday – Friday at 10.15am at Castleford and 9.15am on weekends or during the school holidays. Bring your little ones aged 2 years and above to have fun in the snow, making snow angels and throwing snow around! Including a free child’s drink afterwards. Relax with a coffee whilst the children play in our free soft play area. Pre-book clothing hire for only £2.00 on 0333 0030520. Children's School Holiday Camps Members receive priority booking! Children aged 7-15 years can keep fit, learn a brand new sport, meet new friends and learn a brand new life skill through our mini-medics, an accredited first aid course for children! Each day is packed full of fun and is excellent value for money. 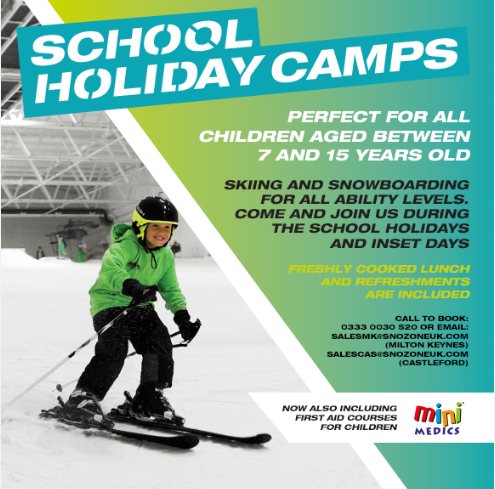 Starting the day, your child will learn to ski or snowboard with our fantastic snow school Coaches, followed by lunch and then either heading back out onto the slopes or take part in fitness drills and then a mini-medics session. We have now also included sign language lessons into the warm side programme too! The camps are available for beginners or experienced skiers and snowboarders. Refreshments are included and Snozone members also receive a 15% discount! Runs 8.30am-5pm and can be booked by the day or week. For more information please email sales.mk@snozoneuk.com (Milton Keynes) or sales.cas@snozoneuk.com (Castleford). Arrange the coolest children’s party at Snozone, with a range of options to choose from. Find out more.